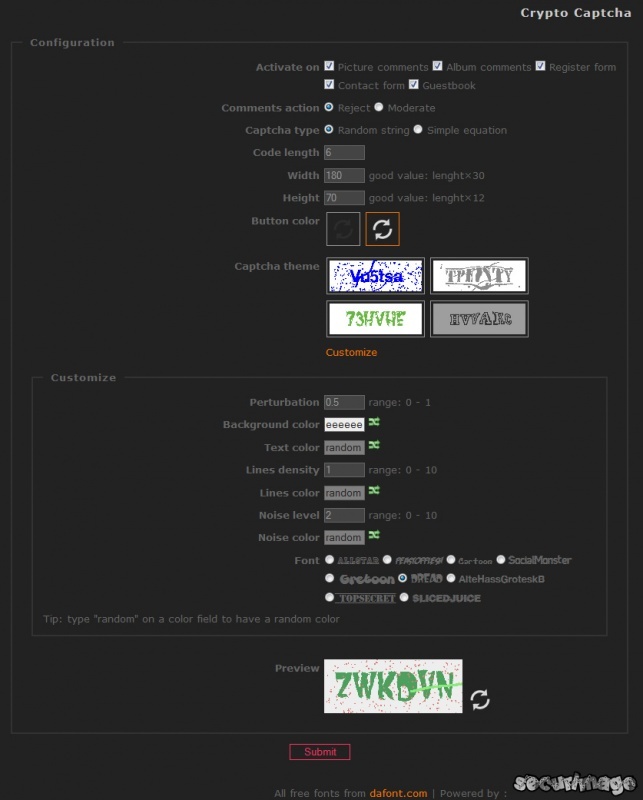 Descrizione: 'Crypto Captcha' (formerly 'CryptograPHP') limits spam in your gallery by adding a captcha in forms for registering, commenting and from the 'ContactForm' plugin. - Production release for Piwigo 2.4. - Compatible with 'GuestBook' plugin. - Each module (picture, album, register, contact, guestbook) can be activated separately. Version officially compatible with Piwigo 2.3. -Fixed display issues on some themes. -'Captcha' disabled on Contact Form with 'Simple' and 'Stripped' themes - doesn't block submission anymore (no viable solution found).